This festive duck is loaded with tasty herbs and spices, and the delicious fat is used to flavour the potatoes and port gravy. Pick the leaves off one of the rosemary sprigs and place on a board with the nutmeg, orange zest, thyme and one tablespoon of sea salt. Chop everything together and rub the mixture all over the ducks, inside and out. Cover and leave in the fridge for a few hours or overnight to let the flavours penetrate. Preheat the oven to 180°C/350°F/gas 4 and place the shelves on the middle and bottom levels. Stuff the ducks with the remaining rosemary sprigs and orange halves, and the garlic cloves, then place them breast-side up, straight on to the bars of the middle shelf. Scatter the onion, celery and carrot in the bottom of a large, deep-sided roasting tray with the cinnamon, ginger, bay leaves, and chopped duck neck and giblets. Place on the bottom shelf beneath the ducks so it will catch all the lovely fat that drips out of them. Meanwhile, place the potatoes in a pan. Cover with cold, salted water, bring to a simmer and parboil for 5 to 10 minutes, then tip into a colander and chuff them up a little. After the duck has roasted for an hour, take the bottom tray out of the oven, replacing it immediately with an empty tray. Spoon the fat from the veggie tray into a bowl. Put all the veg, duck bits and juices into a large saucepan, then add a little boiling water to the tray to get all the sticky brown bits off the bottom – this is what you’re going to make your gravy with. Tip the water and brown bits into the pan with the veg, top up with 1 litre of water or chicken stock and place on a medium heat, skimming off any of the fat that rises to the top. Put your parboiled potatoes into the empty tray in the oven. Add a few more tablespoons of duck fat from the bowl, season, and place back underneath the ducks to cook for an hour. Meanwhile, heat a saucepan and add 2 tablespoons of duck fat. When it’s hot and melted, add the flour and stir with a wooden spoon until you have a paste. Stir in the contents of the saucepan and the port. Bring the gravy to the boil and simmer gently for half an hour, stirring occasionally. By now the ducks will have had 2 hours in the oven and will be done. Lift them on to a plate, cover loosely with tin foil and leave to rest for about 15 minutes. Pour the gravy through a sieve into a clean saucepan, pressing down on all the veg and other bits to extract as many flavours and juices as you can. Keep the gravy warm in the saucepan, again skimming off any fat on the surface. Don’t carve the ducks – the best thing to do is to pull the meat away from the bones with a pair of tongs or with your fingers wearing clean kitchen gloves, then let everyone fight over the delicious skin! Serve with your potatoes and port gravy. or recipes and menus found on our sites for commercial purposes. I used a 6 inch pie mould. 01.For the pastry, mix the flour, polenta and a pinch of salt in a food processor. Add the cold butter and pulse until the mixture resembles breadcrumbs. Tip into a bowl, add 50g of the grated Parmesan and mix with a table knife until the mixture comes together. Measure out 4 tbsp cold water and add a little at a time until the dough just sticks together (you may not need all the water). Knead it gently until it forms a ball, wrap the pastry in cling film and chill for 20 minutes in the fridge. 02.Meanwhile, preheat the oven to 200°C/fan180°C/gas 6. Scatter the sliced butternut squash over 2 or 3 large roasting trays, drizzle with half the olive oil, scatter over the cumin seeds, ras el hanout and chilli flakes, and season well with salt and black pepper. Roast in the oven, stirring occasionally, for 40 minutes. 03.Meanwhile, add the sliced onions and garlic to another roasting tin with the rest of the olive oil. Halfway through cooking the squash, add the onions to the oven and roast for 20 minutes. Remove the squash and onions from the oven, squeeze out the garlic from their skins, mash the roasted garlic into the onions and leave to cool slightly. 04.Place the spinach in a colander over the sink and pour over a kettle of boiling water. Refresh under cold water, then squeeze dry to remove all the excess water. Chop the spinach, put into a bowl, season and mix with the ricotta, then set aside. 05.On a lightly floured surface, roll out two-thirds of the pastry and use it to line the base and sides of a 23cm springform tin. Add half the spinach mixture in a layer, then distribute half the roasted squash on top of that. Scatter with half the pine nuts, then half the goat’s cheese. Repeat with the rest of the spinach mixture, butternut squash, pine nuts and goat’s cheese. Finally, add the garlicky onions in a layer on top. 06.On a lightly floured surface, roll out the rest of the pastry, then lay on top of the pie, pushing in the edges to seal well. 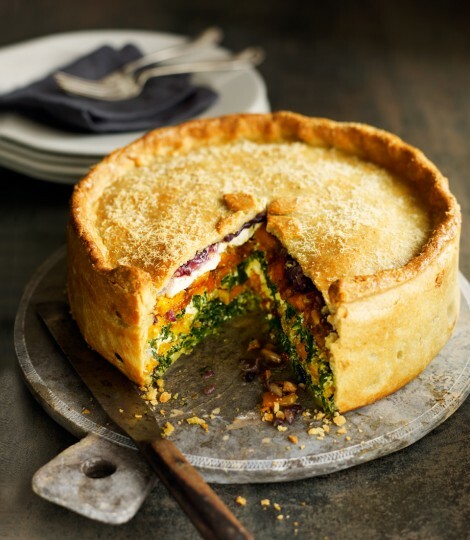 Make a hole in the middle of the pie and decorate the top with leaves made from any leftover pastry. Brush the top of the pie with beaten egg, scatter with the rest of the Parmesan and chill for 20 minutes. 07.Cover with cling film and foil and freeze, uncooked, for up to 1 month. 08.When ready to eat, remove the foil and cling film and defrost fully in the fridge. Preheat the oven to 200°C/fan180°C/gas 6 and bake for 30-35 minutes until the pastry is golden brown on top. Leave to cool in the tin for 10 minutes before serving.